Power surges and other unforeseen emergencies can cause damage to delicate electronics and cause you to lose important information. 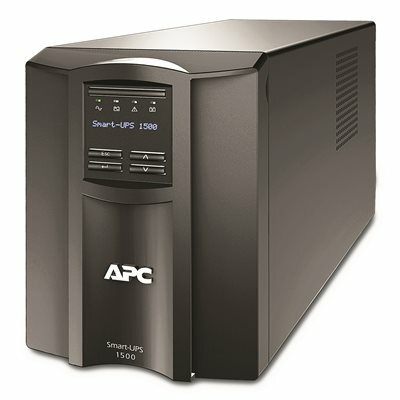 This uninterruptible power supply helps keep servers and other mission-critical devices up and running, so you can make sure everything is safely saved and backed up. Keeps critical servers and switches up and running, even in the event of a power outage or spike. 8' cord offers flexible placement. 8 battery- and surge-protected outlets help make sure your delicate electronics are safe. 4 outlets can be controlled separately from the UPS, allowing discrete reboot of hung systems and noncritical load shedding. 680 joules, 1,440VA and 1,000-watt capacity. Backed by the manufacturer's $150,000 connected-equipment guarantee. Cloud-enabled monitoring allows you to see the status of your machines from almost anywhere with Internet access. Easy-to-read LCD interface provides real-time updates with a quick glance. Intelligent battery management shows a predictive month and year for battery replacement. Automatic voltage regulation adjusts high and low voltages to a safe level, helping to keep equipment safe.